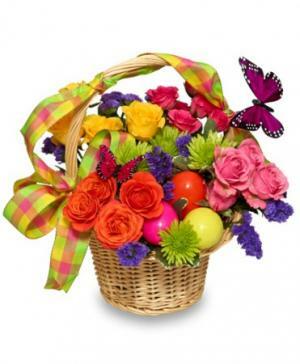 Easter Flowers Warrington, PA | ANGEL ROSE FLORIST INC. CELEBRATE EASTER with this EGG-CELLENT EASTER BLOOMS Basket from ANGEL ROSE FLORIST INC.! Pave the way for warmer weather with spring flowers that capture the playfulness of Peter Rabbit's favorite season! Call direct or order a floral arrangement from our website 24 hours a day. White Daisies, Yellow Roses And Green Button Spray Chrysanthemums, Presented In The Happy Chick Keepsake. 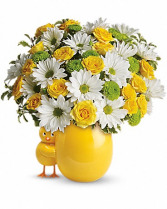 This adorable bouquet will brighten any room with its beautiful blooms. Who could resist the ceramic chick! - Add some pink or blue for baby too! It's Spring at last and time to celebrate with this basket of springtime favorites, red tulips, blue hyacinth and yellow daffodils. There's so much to love about this cheerful gift and you can be sure it will be appreciated. 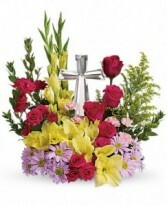 Order a bouquet of Spring flowers online or call ANGEL ROSE FLORIST INC. today! What better way to celebrate Easter than with the candy-colors of springtime? Think you're too old for an Easter basket? Think again! Order a lush basket of Easter flowers from ANGEL ROSE FLORIST INC. for yourself or any bunny who needs a little pick-me-up! Whether your style is bright and cheery gerbera dasies, or powdery pastel lilies, this Warrington florist has you covered!